Spelt is one of the three ancient hulled wheats. 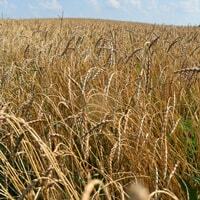 At Weatherbury Farm, we grow Oberkulmer Spelt, which is a robust old Swiss landrace. Oberkulmer is a true spelt with no modern wheat genetics. Prized for its superior nutrition, spelt is higher than wheat in protein, minerals and vitamins. With a gluten entirely different from wheat, spelt imparts a nutty flavor. 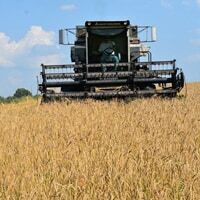 In 2018, spelt was grown in Independence Township on 4.7 acres on the farm established by R. Meloy, Esquire in 1829. Meloy was a farmer, grain, stock and wool grower. More recently the farm was a dairy farm and a cattle farm. Weatherbury Farm has farmed this land since 2015. The spelt was planted on October 21, 2017. Clover was frost seeded into the grain on April 23, 2018. The spelt was harvested on July 14, 2018. At the 2018 Washington County Fair, the Oberkulmer Spelt sheaf won 1st place and the jar of Oberkulmer Spelt grains won 2nd place. More information on spelt and other grains are on the grains we grow page. To read more about spelt flour, please visit our products page. Spelt flour can be ordered on our order page. 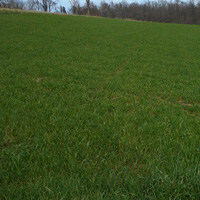 Spelt Field : Look closely and you can see the frost-seeded clover in the undergrowth.